BUILDING STORIESA selection of projects, recent and past, realized or speculative, along with exhibited, published or awarded work, to explore and discuss contemporary architectural production. 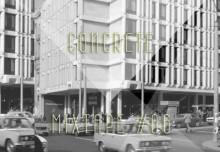 URBAN NARRATIVESA selection of projects, practices and events that explore and discuss contemporary urban living environments. 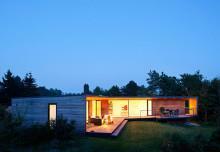 ROOM TALESA selection of projects that discuss, explore and evoke qualities and aspects of interior environments. 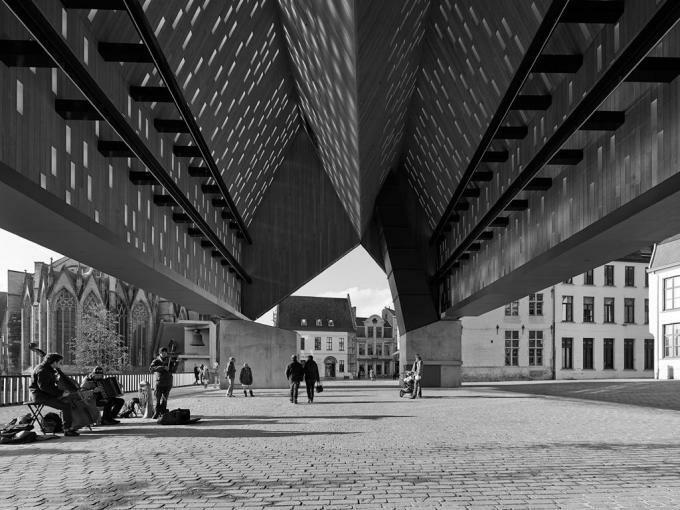 The 5 Finalists for the Mies van der Rohe Award 2013, announced last week, is a showcase of exemplary architecture work for public and community spaces in European cities. 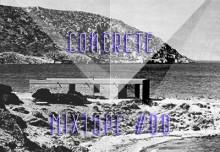 Featuring rare creative collaborations, participatory initiatives and innovative design, the shortlisted projects involve redevelopment and reactivation interventions in both historic and contemporary urban evironments as well as cultural and health care establishments that introduce a gripping approach to architectural production in the field. 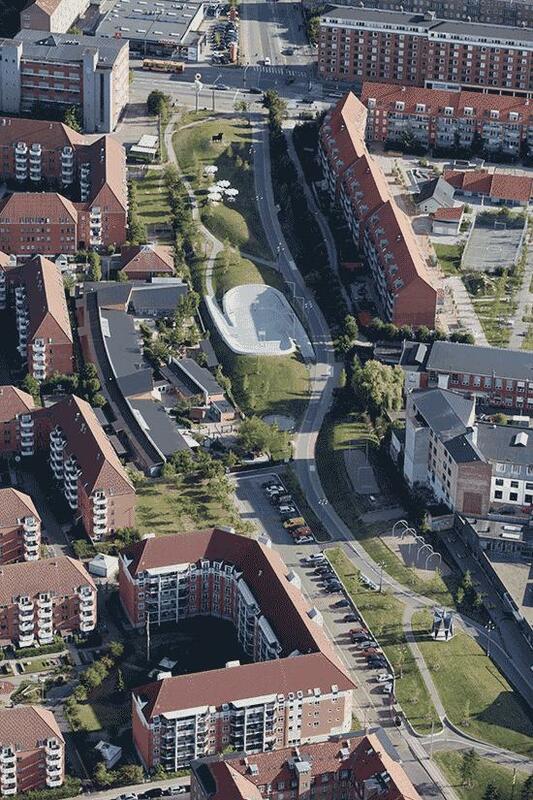 Urban park, Copenhagen, Denmark; Superflex in collaboration with BIG, Bjarke Ingels Group and Topotek1. Superkilen, Copenhagen, Denmark by Superflex; BIG; Topotek; 2011, photography © Superflex. 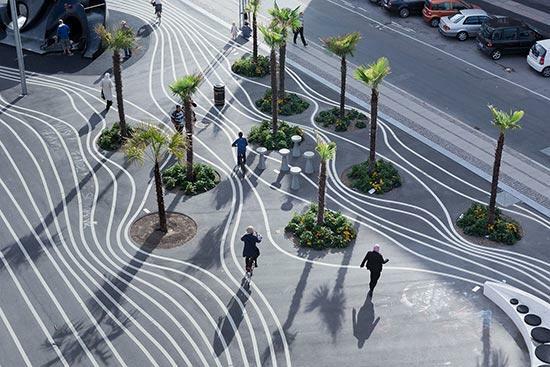 Superkilen is a half mile long linear park in Copenhagen, situated in the most ethnically diverse part of the city. The result of the creative collaboration between BIG, Topotek1 and Superflex, constituting a rare fusion of architecture, landscape architecture and art, Superkilen is divided in three color coded areas to highlight different public activities and is populated with urban furniture from more than 50 countries, the architecture team asked the residents in the vicinity of the park to designate. 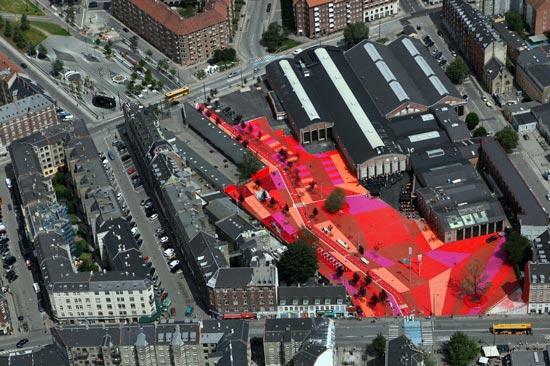 Superkilen, The Red Square, by Superflex; BIG; Topotek; 2011, photography © Iwan Baan. Superkilen, The Black Market, by Superflex; BIG; Topotek; 2011, photography © Iwan Baan. Superkilen, The Green Park, by Superflex; BIG; Topotek; 2011, photography © Iwan Baan. 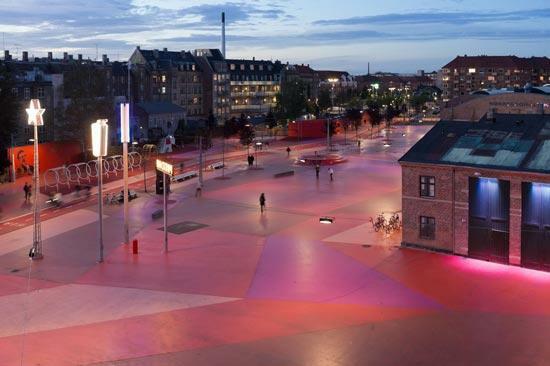 The Red Square, a patchwork of pink rubber that covers the ground and sides of the buildings, designates the modern, urban life with café, music and sports. The Black Market is the classic square with fountain and benches, washed out in white stripes that curve around the furniture and trees. The Green Park is a park for picnics, sports and walking the dog, featuring a landscape of grass plains and hill. Cultural Building, Reykjavik, Iceland by Henning Larsen Architects in collaboration with Batteríid architects and Studio Olafur Eliasson. Harpa Concert Hall $ conference Centre, 2011, Henning Larsen Architects; Bateríid Architects; Studio Olafur Eliasson. 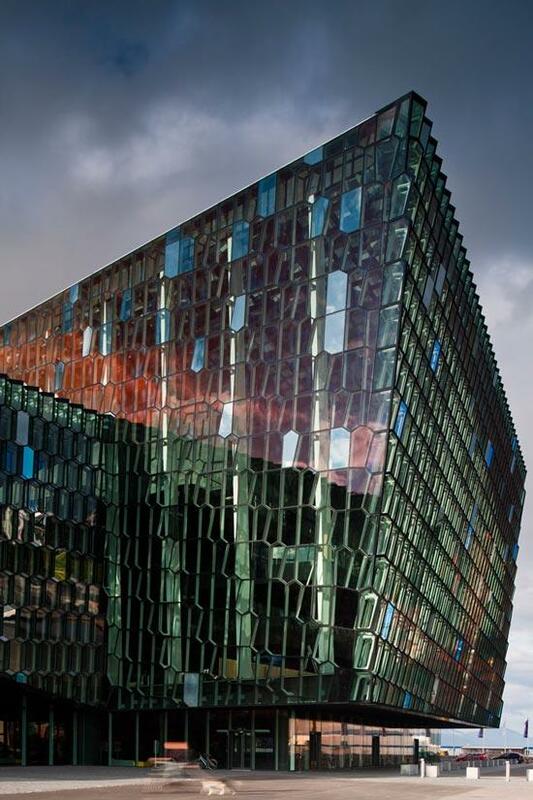 Situated on the border between land and sea, The Harpa Concert Hall & Conference Centre in Reykjavik stands out as a large, radiant sculpture reflecting both sky and harbour space as well as the vibrant life of the city. Part of an extensive development plan for the east harbour in Reykjavik – with the objective of bringing the city and harbour closer together, the Concert Hall of 28,000 m2 is situated in a solitary spot with a clear view of the enormous sea and the mountains surrounding Reykjavik. Harpa Concert Hall & conference Centre, 2011, Henning Larsen Architects; Bateríid Architects; Studio Olafur Eliasson. The building features an arrival and foyer area in the front of the building, four halls in the middle and a backstage area with offices, administration, rehearsal hall and changing room in the back of the building. Seen from the foyer, the halls form a mountain-like massif that similar to basalt rock on the coast forms a stark contrast to the expressive and open facade. At the core of the rock, the largest hall of the building, the main concert hall, reveals its interior as a red-hot centre of force. The spectacular facades have been designed in close collaboration between Henning Larsen Architects and the Danish-Icelandic artist Olafur Eliasson. 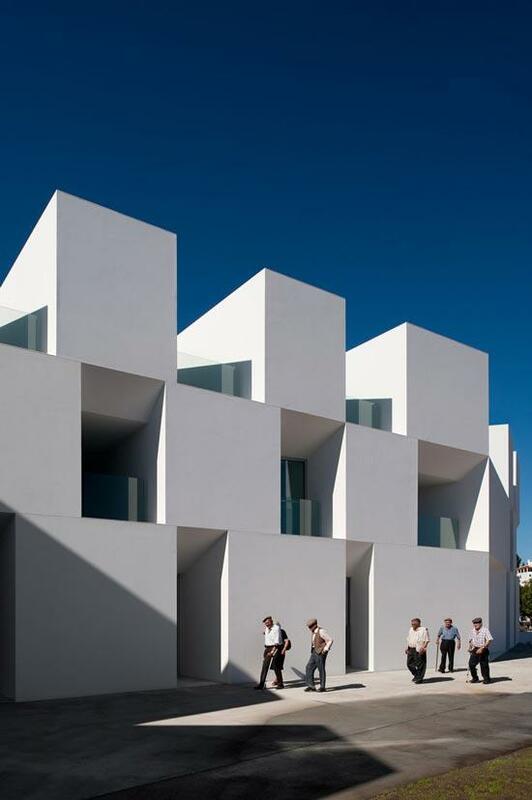 Hospital/Health Care, Alcácer do Sal, Portugal by Aires Mateus Architects. 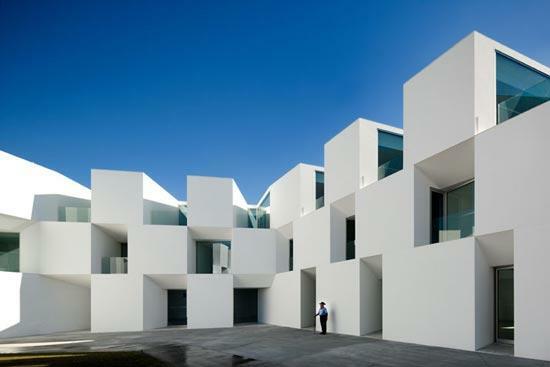 House for Elderly People by Aires Mateus Architects, 2011, photography © Fernando Guerra, FG+SG Architectural Photography. 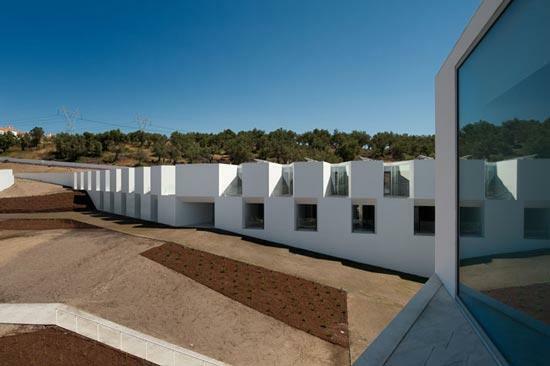 Based on an attentive reading of the life in a very specific kind of community, a sort of a micro-society with its own rules, House for Elderly People in Alcácer do Sal by Aires Mateus Architects, embodies a program somewhere between a hotel and a hospital. 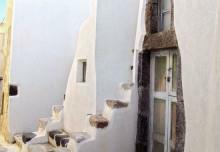 Through an expressive and clear design that naturally rises from the topography to organize the entire plot, the building forms out of an accumulation of secluded units, combined into a unique body. Seeking to understand and reflect on a combination of social and private spaces, as well as create a variable and emotive experience for its inhabitants, House for Elderly People is designed to answer in a resourceful way the needs of a social community and its individuals. 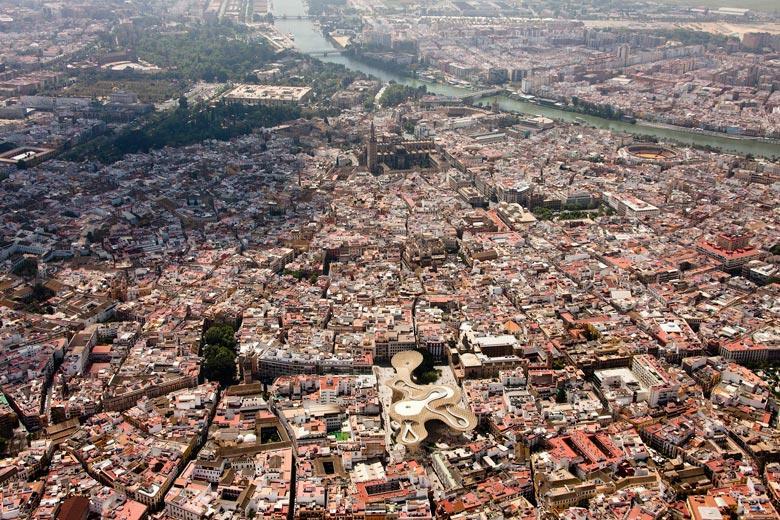 Mixed Use, Seville, Spain by J. Mayer H. Architects. 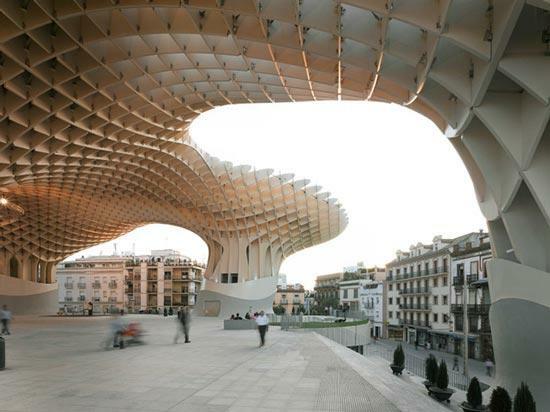 Conceived as a contemporary landmark to define a unique relationship between the historical and modern city of Seville, Metropol Parasol is an impressive organically shaped timber structure, that rises from the archaeological space of Piazza de la Encarnation within the dense fabric of the medieval part of the city. Metropol Parasol by J. Mayer H, Seville, Spain, 2011, photography © Fernando Alda. 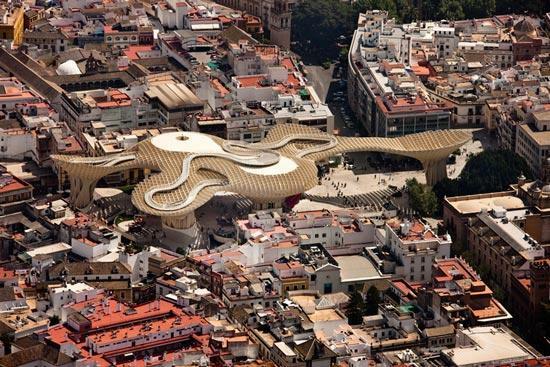 Designed by J. Mayer H. Architects, the polyurethane coated timber construction offers an archeological site, a farmers market, an elevated plaza, multiple bars and restaurants underneath and inside the parasols, as well as a panorama terrace on the very top. 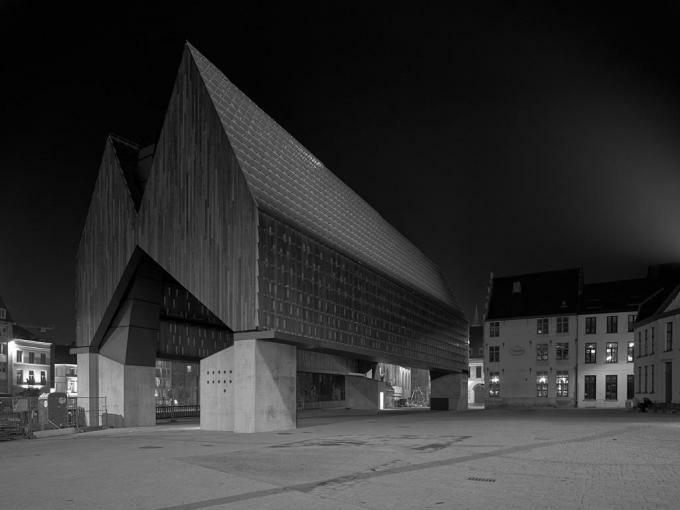 Mixed Use, Ghent, Belgium, Robbrecht en Daem Architects and Marie-José Van Hee Architects. 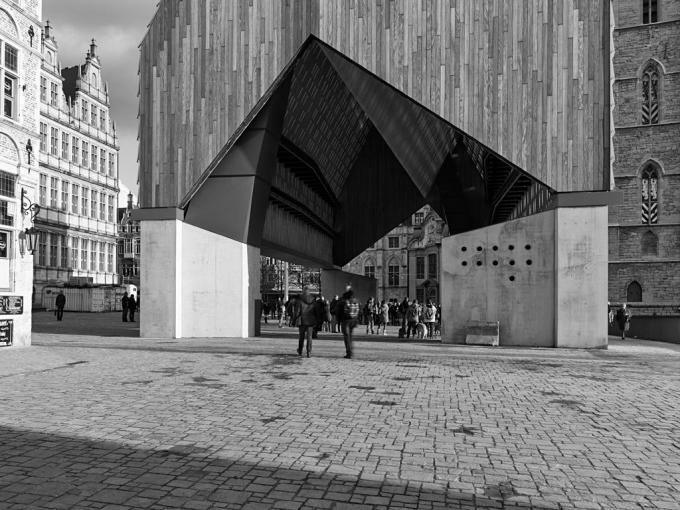 More of a container, an urban interior to reactivate the social life in Ghent’s formerly degenerate public square, Market Hall is the winning proposal of Robbrecht en Daem and Marie-Jose Architects, countering the initial program of the two respective competitions held in 1996 and 2005. 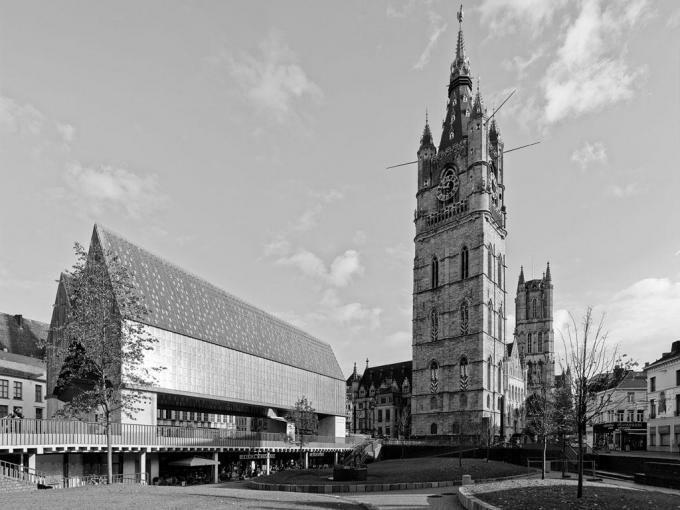 Situated in between three Gothic Towers, the structure assumes the lower height of adjacent buildings and employs the use of wood to finish its exterior. While the dual modulated wooden ceiling embraces the passer by, the existing inclination of the site allows for the creation of a second level that opens up on one side to a grass blanketed area, hosting a brasserie, a bicycle parking and sanitation facilities. Large buffer basins to absorb rainwater, principles of low energy consumption for the brasserie, use of truly natural materials and the incorporation of public transport into the masterplan, all contribute to a clear vision of giving new value to the historic centre, respecting and drawing upon its spatial qualities. ©2009 - 2019 SIAS SA. ALL RIGHTS RESERVED.